The All India Muslim Personal Law Board has started talks with Muslim MPs from Opposition parties, urging them to stall the passage of the bill in the Parliament. LUCKNOW: Although a bill to criminalise triple talaq has reached the lower house of the Parliament on Thursday, the All India Muslim Personal Law Board (AIMPLB) is making a last-ditch attempt to get the bill, which they say is unconstitutional and un-Islamic, stalled. The AIMPLB, which had written to the Prime Minister Narendra Modi on December 25, to review the bill in its present form, has started talks with Muslim MPs from Opposition parties, urging them to stall the passage of the bill in the Parliament. “Opposition MPs can at least get it sent to a parliamentary select committee for review,” says Zafaryab Jilani, a member of the AIMPLB. “We are following only parliamentary ways of opposing the anti-Muslim bill," AIMPLB spokesperson, Maulana Khalilur Rehman Sajjad Nomani. However, Muslim women have come out in large numbers in support of the bill. They feel that their rights will now have the backing of the law. Meanwhile, several Muslim men continue to hand out "teen talaq" on the most absurd ground with impunity. Likewise, when one of his hens went missing, Hassan of Badaun decided that he has had enough and uttered talaq thrice, forcing his wife Sanjeeda and their six-month-old daughter out of their house at 11 p.m.
“Teen talaq is a tool to get rid of a woman after using her to fulfill the biological needs of man”, says Sameena of Lucknow while backing the Centre’s efforts to make a law against the practice of Triple Talaq. “These men should be punished the way Asaram Bapu was,” adds Sameena. “It’s a day of reckoning for the entire patriarchal community, especially the ulemas and clerics, who should be equally blamed for the plight of talaq victims as they are the ones who validate this obnoxious practice in the name of Shariat and religion,” says Shahla of Sultanpur. 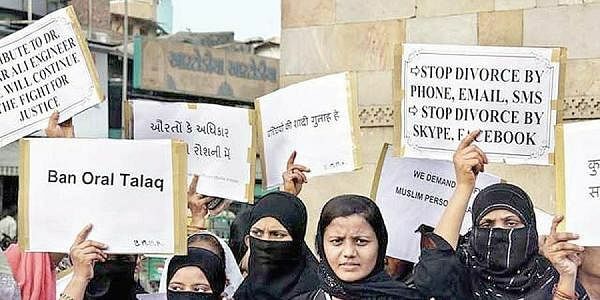 While questioning the stance of the AIMPLB on the issue, the Muslim women organisations argue that the Board has never come to the rescue of talaq victims who suffer day in and day out with their children, post-estrangement. “No financial support was ever extended to such women by the Board. Now when a law is being framed against the practice, they are howling,” says Shaheen Parvez rejecting the Board’s interference in the issue anymore. She questioned the locus standi of the AIMPLB when even the apex court of the country has declared the practice illegal. Even Shia Waqf Board chief Waseem Rizvi has also backed the bill seeking 10 years imprisonment for the perpetrators in place of three years. The bill introduced in the Lok Sabha on Thursday proposes to make the practice of triple talaq a punishable offense.